Drought. Dry. Arid. Barren. Parched. You can find more synonyms to describe our current situation in a thesaurus like I did. You may have heard the Sierra Nevada and the vast majority of Nevada and California are in a drought. The Sierra and areas adjacent to the Sierra currently exist somewhere between the 1 and 13th percentile for precipitation during the past 24 months. We thought we saw the light at the end of the tunnel with the precipitation we received in November and December. We were wrong. While the precipitation helped, the high snow levels mitigated some of the effects and optimism. Additionally, we have been bone dry all of January. HOW DRY DO YOU ASK?! Drier than drinking Extra Brut Champagne, while eating saltine crackers during the summer in the Atacama Desert….that might be slightly exaggerated but you get the point. 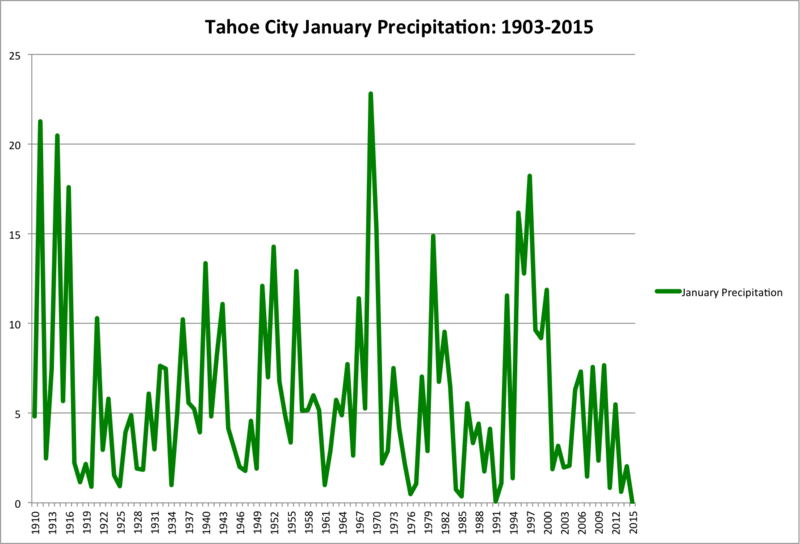 Figure 1: Tahoe City January precipitation (in.) from 1910-2015. The average January Tahoe City precipitation is 5.83". Currently, Tahoe City has received 0" of precipitation in January (Figure 1). Tahoe City has never received 0" of precipitation during January. NEVER. The lowest was 0.08" in 1991 and the next lowest was 0.35" in 1985. Tahoe City has received less than 1" of precipitation in January only 9% of the time and 3% of the time Tahoe City received less than 0.5". Including 2015, the past five Januaries (2011-2015) have had below average precipitation. Tahoe City has had four previous instances where five or more consecutive Januaries received below average precipitation (record was 9: 1984-1992). However, the past five Januaries have yielded a total of 8.99" of precipitation. That is 2.47" below the next lowest total (for consecutive Januaries) for the period of record. Figure 2: Tahoe City January snowfall (in.) from 1930-2015. The average January Tahoe City snowfall is 45". 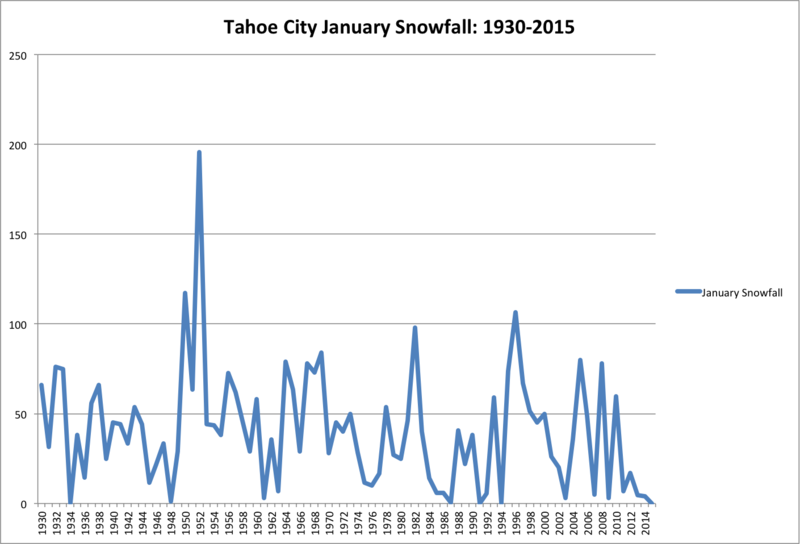 When examining the Tahoe City snowfall record, it is even more bleak (Figure 2). It has received 0" of snowfall this year (duh) and the only time that has occurred before this year was 1991 and essentially 1934 (0.1"). This is the lowest snowfall period since the aforementioned mid 1980s to early 1990s. The past five Januaries (2011-2015) have yielded 32.5" of snow. That is below the monthly average for ONE January. The next lowest five consecutive Januaries' total was 66.4" from 1983-1987. Granted, low precipitation or snowfall in January does not always result in a dry winter. In 2011, Tahoe City received 0.84" of precipitation and 7" of snowfall, but it was one of the wettest, snowiest winters on record in the Sierra. This is only one location, but I use it as an example of the larger area (the Sierra). Figure 3, a table from the National Weather Service Reno office, demonstrates how dry the past few winters have been. Figure 3: Snowfall totals (in.) 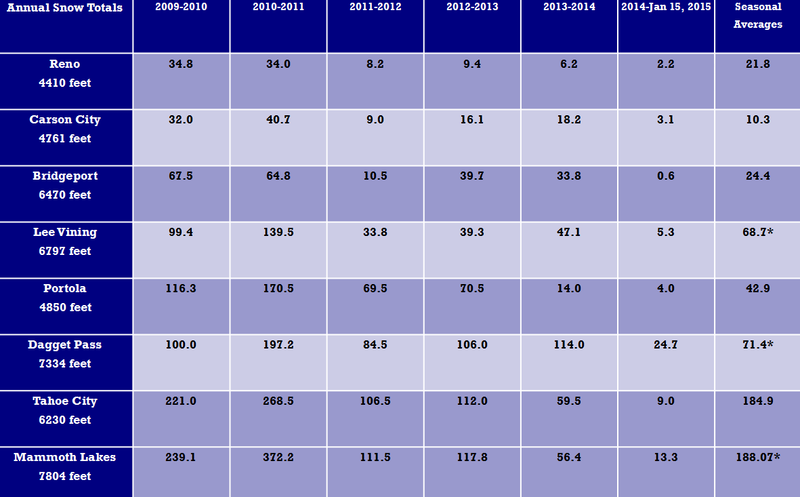 from the past six winters with seasonal averages. Via NWS Reno. Our friends (Nina O.) at the Western Regional Climate Center (WRCC), developed a precipitation probability analysis for stations in the Sierra. Currently, Blue Canyon has a 3.82" deficit of precipitation for the current water year and needs 38.28" to reach or maintain normal precipitation by September 30, 2015. The probability of reaching normal is approximately 33%. That's basically the same chance Armando Benitez gave the Giants of converting a save opportunity from 2005 to 2007.